The buddy comedy is a game of hit and miss -- and Hill and Tatum are a hit. The buddy comedy is a game of hit and miss, and Phil Lord and Christopher Miller are fed up with the old-fashioned, emotionless misses that tend to come in droves. 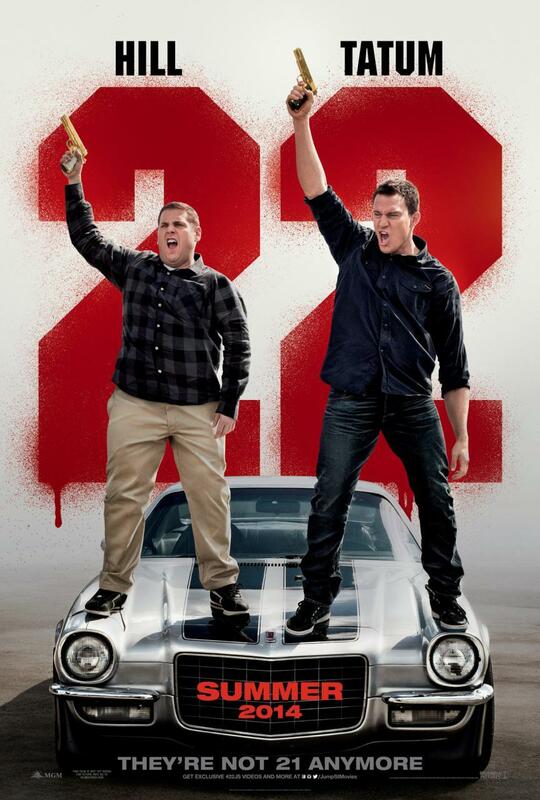 With 22 Jump Street, the pair's third directorial outing (they scored big with 21 Jump Street and February's The Lego Movie), they don't shoot for any sort of revolution in the language of the buddy comedy -- the premise is still unquestionably intact here, but they effortlessly let us in on something that is exciting, hilarious, and deeply heartfelt. Which turns out to be an all-around knockout comedy. 2012's 21 Jump Street first introduced us to Schmidt (Jonah Hill) and Jenko (Channing Tatum), two losers turned police academy graduates who are sent back to high school undercover to infiltrate a drug ring. With 22, it's the same idea. After blowing their cover during a substantial drug deal, Jenko and Schmidt are once again sent to school to find MC State's (they're at college this time, because, hey, they are aging) suppliers of a drug known as "WHYPHY," the latest craze among students that produces both crazy focus for studying and crazy hallucinatory trips for wild nights. Their only lead on the case is a picture of a deceased student (she died from complications with the drug) in an illicit exchange of WHYPHY with a man sporting a bazooka tattoo. They do their research, working their way to MC State's football team, where they find the tattoo on the school's charismatic quarterback Zook (Wyatt Russell). Jenko hits it off bigtime with Zook, so much that Zook convinces him to join MC State's football team, where they become a ridiculous duo, as Jenko becomes Zook's number one receiver, even getting attention from D-1 recruiters. Schmidt, though jealous that he could never hope to fit in with the football team or their fraternity, is caught up with Maya (Amber Stevens), a beautiful art major, who shows him around the school's art and poetry scene. Spending more and more time apart, and rapidly coming into their adult identities, they they have to come to terms with what their friendship and partnership is becoming. More than anything, this is the focus of the second Jump Street installment. At most points in the film, its caper-like plot is secondary to the portrayal of its main characters. Like so many before it, 22 Jump Street examines how even the best friendships can shift and sputter in the prime of young life. What's remarkable is the sheer sincerity and feeling that lie at the film's soft heart. Tatum and Hill churn out moment after moment of comedic brilliance, but what's more is the humanity and care that goes into their on-screen relationship. They dare to make more of 22 than a half-assed exploitation of wooden, all-too-heteronormative male relationships. For that, you'll follow them anywhere. Miller and Lord had people going crazy for their hilariously thoughtful The Lego Movie, and they're going in just the right direction here. They never even begin to take themselves seriously, throwing in a slew of zinging self-references that mainly address the absurdity of the fact that they actually made a sequel -- and a damn good, hilariously Hollywood-defying one at that. It's a delight to see such a sense of self awareness carry their movie with a breeziness that only comes from complete realization of a universal truth- high profile sequels are tricky to pull off. They're masters of effortlessly self aware comedy that draws laughs from even the most innocent, low-key gags. In a world where comedy too often revolves around malice and prejudice, Miller and Lord, alongside writers Michael Bacall, Oren Uziel, and Rodney Rothman not only bring it back to its harmless (though at times obscene) basics, they manage to subtly and hilariously subvert sexism, ideas of masculinity, and homophobia into an unlikely, scrappily original, and comedy from a tried-and-true concept. Calling it pure entertainment wouldn't be unwarranted, but it deserves a lot more than that.